This cotton panel displays the signature elements that have come to make Coogi a recognizable brand worldwide. With asymmetrical lines, a variety of different textures, and a plethora of bright colors this fabric offers all the energetic vibrancy associated with the Coogi brand. For many people today the name Coogi calls to mind the particular sweater referred to by the 1990s hip-hop group Hilltop Hoods as the “Cosby Sweater.” But Coogi’s iconic bright patterns were not always part of the pop culture lexicon. The Australian company began with less ostentatious goals in mind, producing sweaters that were marketed towards American and European tourists as souvenirs. In this panel, entitled Sandune, the natural waving forms created by the bold colors demonstrate the intention to mimic the curving dunes found in the Australian outback. The animated natural forms and vivid colors are also expressive of the designs found in Australian Aboriginal artwork. These fabrics were designed to bring to mind the rich and exotic landscape and culture of Australia. So how did these souvenir sweaters intended to convey the colorful experience of visiting Australia come to be so popular in American hip-hop culture? This transformation of meaning began when Bill Cosby, star of The Cosby Show, took to wearing Coogi sweaters, which were at the time a symbol of the elite, usually white, world traveler. As a middle-class African-American TV dad, Cosby’s staple Coogi sweater became a status symbol to a new market of consumers, the youthful hip-hop scene of the 1990s. Rappers such as Notorious B.I.G began to incorporate Coogi into their wardrobes and their lyrics, “Living better now, Coogi sweater now.”(1) The bold sweaters transformed from upscale souvenirs to status symbols and the company expanded, creating a full line of apparel targeted towards their new urban market. (2) Coogi continues to produce their signature clothing pieces and has recently launched a new collection that has been embraced by today’s popular hip-hop artists including Riff Raff and Drake, continuing to assert Coogi as a pop culture emblem. 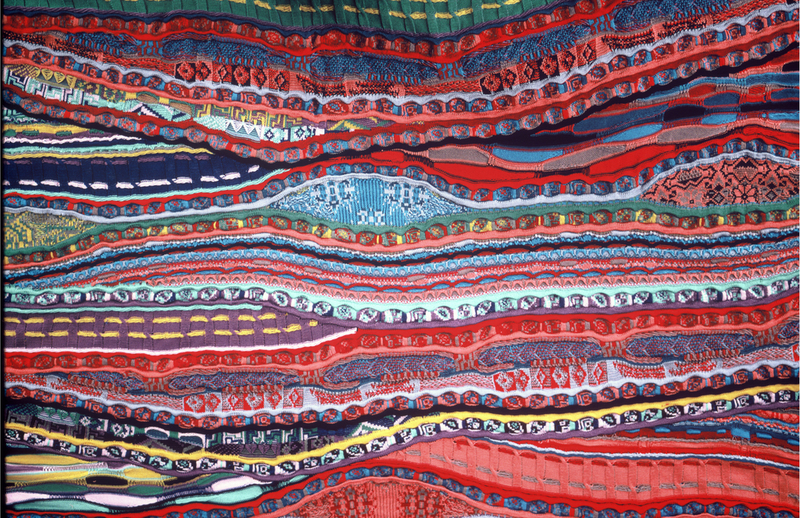 While the iconic Coogi patterns have taken on different cultural meanings, the forms and colors of the Australian wilderness still persist as the defining feature of this panel. Chanel Host is a graduate student in the History of Design and Curatorial Studies at Parsons The New School of Design. She is a Textile Fellow at Cooper Hewitt with an interest in Twentieth-Century American Design. (1) Notorious B.I.G. “Big Poppa” Ready To Die. Bad Boy Records, 1994. (2) Detrick, Ben. “Nineties Nostalgia Propels Coogi Brand Resurgence.” The New York Times. April 04, 2014. Accessed February 16, 2016. Bill Cosby never wore a Coogie sweater…ever. The woman that ran Wardrobe on The Cosby Show thought they were too bright and crazy…still to this day. Big Poppa wore them because this was and still is the coolest gear for people who wear larger sizes and appreciate the artistic craftsmanship of each and every piece.